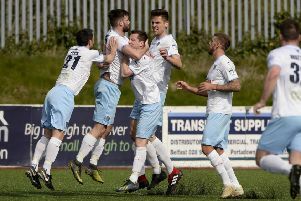 Ballymena United manager Glenn Ferguson admits that his side needs to strengthen in the summer to compete with the ‘big guns’ of the Danske Bank Premiership. Saturday’s 3-1 defeat to title-chasing Crusaders means that Ballymena have amassed just four points from a possible 36 in 2015. Glenn Ferguson says his needs to bring in better quality of players at Ballymena United this summer. Picture: Pacemaker Press. “It’s no secret we need better players into the squad and we need braver players, who are going to stand up and be counted. “The Board are under no illusions that that’s what we need and we’ve spoken about it at length, how we can improve this going forward. “We can’t compete with teams who have better finances than us but we are where we are and we try to get the best out of our players. We can get results on any given day but on a consistent basis we can’t do it,” said Ferguson, who was disappointed with some aspects of his side’s performance. “We were beaten by a bigger, more physical team who played to their strengths. We couldn’t cope with that physical presence. “We were missing a lot of key players which certainly had an impact. We had players who came in to push for a place - some did OK, some didn’t. “They have big men up front who they get the ball to, who do what they’re good at and they have good players who work off them. They defend well, don’t take many chances and don’t concede many goals because of that. “For large parts we got sucked in to doing exactly the same thing - they were better than us at it,” he added.